In Omaha, Nebraska, the leaders of a Black Panther group, Ed Poindexter and Mondo we Langa (formerly David Rice), were the targets of a clandestine operation of the Federal Bureau of Investigation code-named COINTELPRO. J. Edgar Hoover, then FBI director, had ordered the massive but secret operation against the Panthers and other domestic political organizations and individuals. Hoover’s goal was to “disrupt” the Black Panthers out of existence by targeting its leadership for elimination, prosecution and a host of dirty tricks. 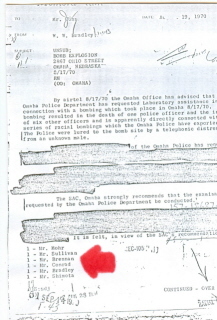 The Aug. 17, 1970, bombing murder of Omaha policeman Larry Minard provided Hoover and his operatives with the opportunity to put the “Omaha 2” behind bars by charging them with the crime. Officer Minard had been lured to a vacant house by an anonymous phone call about a woman screaming; however, a tape recording of the killer’s voice on the emergency call system was an obstacle to the prosecution of the two Panther leaders. Conrad followed orders and the tape was withheld from defense attorneys and never heard by jurors who convicted Poindexter and Langa in April 1971. At the time of the trial, COINTELPRO was unknown to most Americans and never mentioned at the trial. Jurors were unaware of the duplicity and intervention of the FBI director in the case. Years after the killing, Mondo we Langa obtained portions of his FBI file under a Freedom of Information lawsuit. In a heavily redacted COINTELPRO memo, the plot to withhold the vocal analysis of the tape was revealed. 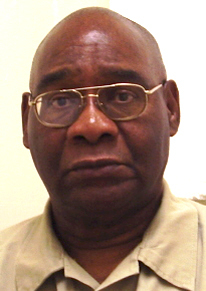 Assistant Chief of Police Glen W. Gates was the police command officer working with the Omaha FBI office to thwart the investigation into the identity of Minard’s killer, betraying his murdered fellow officer to make a case against the two activists. But there were other conspirators in the COINTELPRO plot and some of the highest officials at the FBI were on the distribution list of the damning memorandum. Receiving copies of the memo from supervisory Special Agent Wayne W. Bradley to Conrad at the FBI Crime Laboratory were John P. Mohr, William Cornelius Sullivan, Charles “Chick” Brennan and John Edward Shimota. Alexander Rosen and George C. Moore were also clued in to the secret operation in a follow-up memo three days later. Mohr, assistant to the director, was a top boss and the closest of the plotters to Hoover. Mohr took charge of the Bureau in the days following Hoover’s death in 1972 and was tasked with arranging Hoover’s funeral until President Richard Nixon decided Hoover should have a state funeral, where Mohr served as an honorary pallbearer. Mohr, along with Hoover’s personal secretary, Helen Gandy, oversaw the shredding of Hoover’s notorious secret files about which he had lied to Acting FBI Director L. Patrick Gray while denying their existence. Mohr, who was forced out of the Bureau within a month of Hoover’s death, eventually became disgraced after his role in the U.S. Recording Co. corruption scandal was revealed. Attorney General Griffin Bell was unable to prosecute Mohr because of a statute of limitations but uncovered Mohr’s extensive use of FBI personnel as his own personal work crew – having them build furniture, repair appliances and upkeep his automobile – and also his acceptance of gifts from companies doing business with the Bureau. Conrad, the recipient of the confidential COINTELPRO memo, was also later caught in the U.S. Recording Co. investigation taking over $20,000 of expensive electronic equipment for his home use. Conrad too avoided prosecution because of a statute of limitations but had to make partial restitution to the Bureau and returned 29 boxes of electronic equipment. Sullivan, an assistant director of the Domestic Intelligence Section and later assistant to the director, was the chief architect of COINTELPRO and likely was the point man who monitored developments in Omaha. Sullivan admitted knowledge of the Omaha case in a speech to United Press International reporters in October 1970, his last speech as an FBI official. Although Sullivan steadfastly denied the existence of COINTELPRO during his tenure at the Bureau, he did tell an interviewer after he left the agency, “I was opposed to Hoover’s discontinuing COINTELPRO.” Sullivan then explained the clandestine chain of command. Sullivan’s departure from the FBI was not long after the Omaha 2 trial in 1971. Sullivan coveted Hoover’s job and made a bid to oust the director by revealing to an administration official that Hoover had secretly wiretapped Henry Kissinger. Nixon was enraged and demanded the wiretap logs, which Sullivan secreted out of FBI headquarters. When Hoover learned of Sullivan’s disloyalty, he fired Sullivan and changed the locks before any more documents ended up where they didn’t belong. Brennan was Sullivan’s chief investigator and entrusted with cracking the Pentagon Papers case. Daniel Ellsberg’s secret report on the war in Vietnam was breaking news and Brennan was assigned to find the leak. Brennan inadvertently crossed Hoover by interviewing Ellsberg’s father-in-law after misreading Hoover’s shaky handwriting. Ellsberg’s in-law was a friend of Hoover’s and was to be left alone. Hoover ordered a demotion for Brennan following the snafu, but Sullivan intervened on his behalf setting the stage for Sullivan’s break with Hoover over the Kissinger wiretaps. Shimota was a special agent assigned to COINTELPRO operations and turned up investigating the American Indian Movement after the Wounded Knee shooting of two FBI agents. By the mid ‘70s, Shimota was working prostitution cases in Fargo, North Dakota, suggesting a fall from grace within the Bureau. In the Fargo case, Shimota was cited for writing the confession of one of the prostitutes. Ed Poindexter and Mondo we Langa, targets of the FBI plot to withhold evidence, were convicted of murder and sentenced to life imprisonment. Both men remain in prison 38 years later at the maximum-security Nebraska State Penitentiary, where they continue to deny any involvement in the crime. Poindexter has a new trial request pending before the Nebraska Supreme Court over the withheld evidence and conflicting police testimony. No date for a decision has been announced. Michael Richardson is a freelance writer based in Boston. Richardson writes about politics, law, nutrition, ethics and music. He is also a political consultant. This story first appeared at OpEd News. 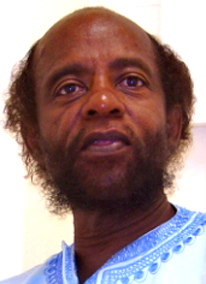 Send our brothers some love and light: Mondo we Langa (David Rice), 27768, Nebraska State Penitentiary, P.O. Box 2500, Lincoln, NE 68542-2500; and Ed Poindexter, 27767, 1-A-12, Nebraska State Penitentiary, Box 2500, Lincoln, NE 68542-2500.